The 300th anniversary of the death of Arcangelo Corelli, one of the most prominent composers of his day, and a decisive influence upon the evolution of modern violin playing, passed largely unheeded on January 8th, 2013. Back in 1776, Charles Burney had been fulsome in his praise of Corelli’s op. 5 Sonatas, describing the set as ‘that upon which all good schools for the violin have been since founded’. That Corelli’s op . 5 Sonatas figure widely in the record catalogues attests principally in their melodic inventiveness and originality. Corelli grouped them as six Sonate di chiesa and six Sonate di camera, so the complete set fits neatly onto two discs, as is the case here. The ‘Church’ sonatas assume four-movement form, alternating slow and fast movements , while the Sonate di camera begin with a ‘ Preludio’ followed by dance movements, with only the last, No . 12, deviating substantially from this model. This is the famous D minor Sonata, ‘ La Folia ‘ , a set of increasingly complex variants upon a fifteenth-century Portuguese dance motif. Corelli was but one of many composers to have appropriated the melody, the most familiar perhaps being Rachmaninov, whose Op. 42 Variations erroneously attribute the ‘La Folia’ theme to Corelli himself. 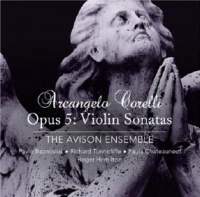 This highly accomplished new recording by the Avison Ensemble, directed by the solo violinist Pavlo Beznosiuk, follows for the most part Corelli’s 1700 texts, wisely eschewing revisions made by Etienne Roger (1710) , who claimed these emendations were authorized by Corelli himself in order to clarify the correct manner of performance . There were other revisions, too, issued in subsequent decades by Dubourg, Geminiani, Matteis, Platti and others, though one of the extraordinary attributes of this new recording is that all ornamentation was improvised spontaneously during the sessions: an impressive feat indeed. The playing of the Avison Ensemble, and in particular of Beznosiuk, has enough audacity, daring and originality to make these astounding performances something truly special. In June 2012 I considered Trio Corelli’s new account on the Bridge label, finding the solo playing of Elisabeth Zeuthen Schneider to be alert and vital, even if the essential clarity of her performances marred somewhat by excessive vibrato . But these stylistically consistent and pleasingly fresh-minted performances had much to commend them, even though they presented no serious challenge to Andrew Manze’s grippingly extrovert Harmonia Mundi version with Richard Egarr (harpsichord). Corelli’s Op. 5 raises one further area of controversy. Is the music best supported by a single keyboard instrument, as with Manze’s Harmonia Mundi version? Or is it permissible to employ slightly larger and more varied forces , as is the case with both the Linn and Bridge traversals? Early printed editions suggest that the supporting part could be supplied by a cello alone (the skilled continuo cellist here is Richard Tunnicliffe), with double stops used to flesh out the harmonies. More recent convention favours the addition of harpsichord or chamber organ (heard in Sonatas Nos. 1, 2 and 4), played here by Roger Hamilton, with guitar (Sonatas Nos. 7 and 12) and archlute played by Paula Chateauneuf. The overall effect is apposite, while the warm and natural recording ambience provided by St George’s Church, Chesterton, Cambridge seems ideal for music of this scale and period. The question of ornamentations, however, remains a vexing and persistent one. As early as 1728, the diarist Roger North expressed the view that many of the tamperings ascribed to Corelli himself in Etienne Roger’s 1710 reprint were unsupportable, adding that ‘Upon the bare view of the print anyone would wonder how much vermin could creep into the works of such a master! ‘Linn’s insert notes make it clear who was responsible, and for what, in this new recording, explaining that the closing movement of Sonata No. 11 includes four variations by Matthew Dubourg (1703 - 67) , and that in the ‘Gavotta’ of the preceding work, the six variations heard are by Beznosiuk himself. Much as I relished the superb playing and thoroughgoing musical intelligence informing these new Avison Ensemble accounts, Beznosiuk doesn’t take the same chances with the music that prove so irresistibly compelling in Manze’s survey. If perceived correctness is more of a priority for you than living on the edge in this music, then I have no hesitation in commending Beznosiuk ahead of Manze. Certainly, these performances will not disappoint in any way. However, for my tastes, Manze’s playing, with its extraordinary passion and daring, still carries the day. As Roger North recalled in 1728, ‘I never met any man that suffered his passions to hurry him away so much whilst he was playing upon the violin as the famous Arcangelo Corelli, whose eyes will sometimes turn red as fire; his countenance will be distorted, his eyeballs roll as in an agony, and he gives in so much to what he is doing that he doth not look like the same man!’ Manze alone succeeds in making the very essence of Corelli leap from the page in his arresting performances, something his rivals either merely hint at, or avoid entirely.